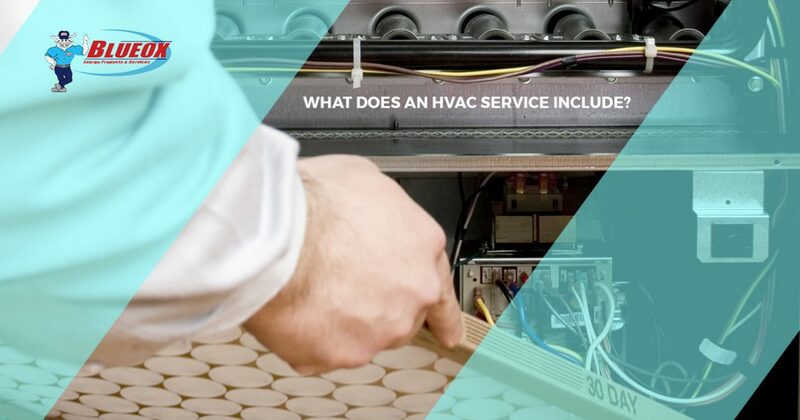 What Does an HVAC Service Include? Now that summer is winding down and the crisp mornings of fall are there to greet you when you awake, it’s time to start thinking about turning on your heater. What happens if you turn it on and it doesn’t seem to be putting out the nice, warm air that you’re used to or it doesn’t work at all? If you’re not trained to diagnose and repair your furnace or heater, it can be frustrating. Luckily, there are people out there who can help you. At Blueox Energy in Oxford, we have trained HVAC specialists who are ready to be dispatched to your home or place of business to get your heater working at full capacity. They are highly trained to be able to troubleshoot and fix a vast array of furnaces and heaters and work as quickly as possible to get your heater running the way it used to. Contact us now to set up an appointment for HVAC service and repair, and read on to find out what is included in an HVAC service call. When our HVAC technician arrives at your home or place of business, they will start by asking you some simple questions, including when you noticed that the heater wasn’t working properly, how long it has been since the furnace was last turned on, and what was the date of the last service. It’s okay if you don’t know all of these answers, but the more information you can provide, the easier the diagnosis will be for your tech. No matter how much information you provide the technician with, they will inspect the entire system to see if there are any immediate issues that need to be dealt with in order for the heater to work as safely and efficiently as possible. If you have an electric heater, they will check the wiring to make sure everything is still hooked up properly and that the connection still carries a good current. If you have a fuel oil or propane furnace, they will inspect the fuel lines and the tank to ensure that there are no leaks, kinks, or blockages. Sometimes, all a furnace needs is some small adjustments and to have a few small parts like filters or o-rings replaced. Whether these parts were damaged or just worn out over time, replacing them oftentimes makes for a fast, affordable repair. For jobs that require more time or special parts, Blueox can make sure that we get the parts quickly and that your repairs will be conducted as soon as possible after the parts come in. If we’ve done everything we possibly can to repair your heater and nothing works, we do have a great selection of new furnaces and heating options that you can choose from. Some of our favorites include Mitsubishi’s ductless heaters that let you heat just the rooms you want. Not only does this make your home more energy efficient, it also saves you a lot of money over time. Contact us at Blueox Energy in Oxford today for information about our HVAC services and our wide range of new heaters and furnaces for your home.